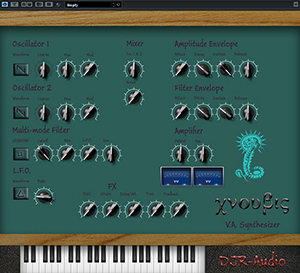 Chnoubis is a Virtual Analogue Synthesizer for the VST platform. Chnoubis is a freeware VST2, VST3 and stand-alone virtual analogue software synthesiser for Windows based PCs. It can be added to your cart in the online shop for free, or downloaded from the downloads section of this site. However, if you so choose donations can be given on the downloads section and all proceeds will be forwarded to Macmillan Cancer Support! Chnoubis, Gk. χνουβις, is a Greco-Egyptian "gnostic" deity and is closely associated with Abraxas and IAO. In the Greek numerological system isopsephy it has the numerical value of 1332, which is 666 x 2, the number of the Sun, Tiphareth, multiplied by the Will of the second sephira, Chokmah. 1332 is also the number of ἄλφα Ω, the Alpha-Omega!